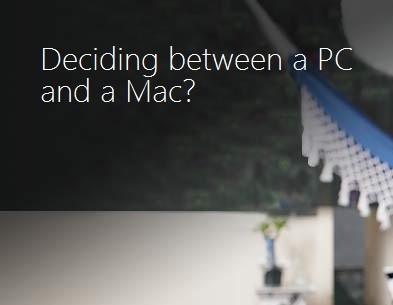 Microsoft has actually published what Mac cannot give you and what PC can give you. Macs might spoil your fun: There are some things you simply can’t do out of the box with a Mac like watch, pause, rewind, and record TV like a DVR. Most of the world’s most popular computer games aren’t available for Macs. And Macs can’t connect to an Xbox 360. PCs are ready to play. Macs can take time to learn: The computer that’s easiest to use is typically the one you already know how to use. While some may say Macs are easy, the reality is that they can come with a learning curve. PCs running Windows 7 look and work more like the computers you’re familiar with, so you can get up and running quickly. Macs don’t work as well at work or at school: If most of the computers in your office or school run Windows you may find it harder to get things done with a Mac. Macs don’t like to share: At least half the fun of having a computer is sharing the stuff that matters to you with other people. This is harder to do on a Mac. Macs might not like your PC stuff: Plain and simple, if you’re a PC user, lots of your favorite stuff just might not work on a Mac. With PCs outselling Macs 10 to 1, the reality is that most computer software is developed to run on PCs. Macs don’t let you choose: PCs give you a lot more choice and capabilities for your money. You can get the PC you want, in the size and color you want, with the features you want. You just don’t have as many options with a Mac.